Poster for The Inglorious Bastards, one of the best-known euro war films. Macaroni Combat, also known as Macaroni War or Euro War films, is a nickname for a broad subgenre of war film that emerged in the mid-1960s, so named because most were produced and directed by European co-productions, notably Italians. The typical team was made up of an Italian director, Italo-Spanish technical staff, and a cast of Italian and Spanish actors and sometimes German and French, sometimes a fading Hollywood star. The films were primarily shot in Europe and later, the Philippines. From the mid 1960s much like the Italian spaghetti western, the Macaroni Combat film mimicked the success of American films such as The Dirty Dozen and Where Eagles Dare. Like spaghetti westerns, Euro War films were characterized by their production in the Italian language, low budgets, added violence, and a recognizable highly fluid and minimalist cinematography. This was partly intentional and partly the context and cultural background of the filmmakers. Throughout the 1960s and 1970s the films were almost all set during World War II with a few about mercenaries in Africa following the success of Dark of the Sun and later, The Wild Geese. In the 1980s most entries in the genre were set during the Vietnam War following the success of The Deer Hunter. Two popular examples of the Italian-made World War II films were Anzio (1968) and Hornets’ Nest (1970) with their A-list cast members. 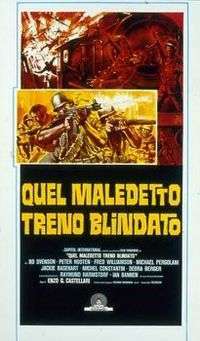 Today, one of the better-known films to fit the Macaroni Combat archetype is the 1978 film The Inglorious Bastards directed by Enzo G. Castellari. Influenced heavily by the aforementioned 1967 American film, The Dirty Dozen, it would later inspire Quentin Tarantino's 2009 film Inglourious Basterds, an American-produced film influenced by the genre as a whole.